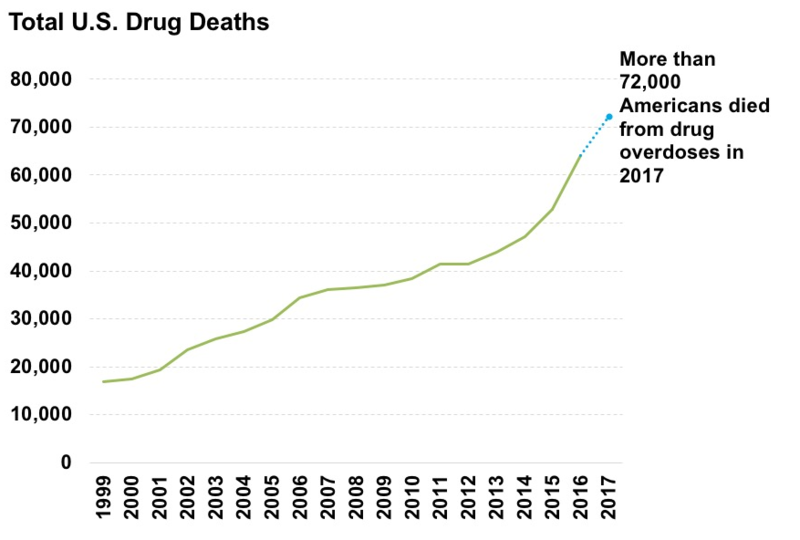 More than 72,000 people died from drug overdoses in 2017, according to the NIH — about 200 per day. That number is more than four times the number who died in 1999 from drug abuse: 16,849. The figures are up about 15 percent from 63,632 drug-related deaths in 2016. In 2017, 40,100 people died in vehicle incidents; 15,549 were fatally shot, not including suicide; 17,284were homicide victims, though an unspecified portion of this number includes gunshot victims; and nearly 45,000 committed suicide. The DEA attributed last year's uptick in deaths to a spike in opioid-related fatalities. The agency said 49,060 people died as a result of abusing opioids, up from 42,249 in 2016. Of those opioid deaths, synthetic opioids were responsible for nearly 20,000. More people died from them than heroin. The DEA report said synthetic fentanyl and comparable types of drugs are cheaper than heroin, making them more attractive to buyers. 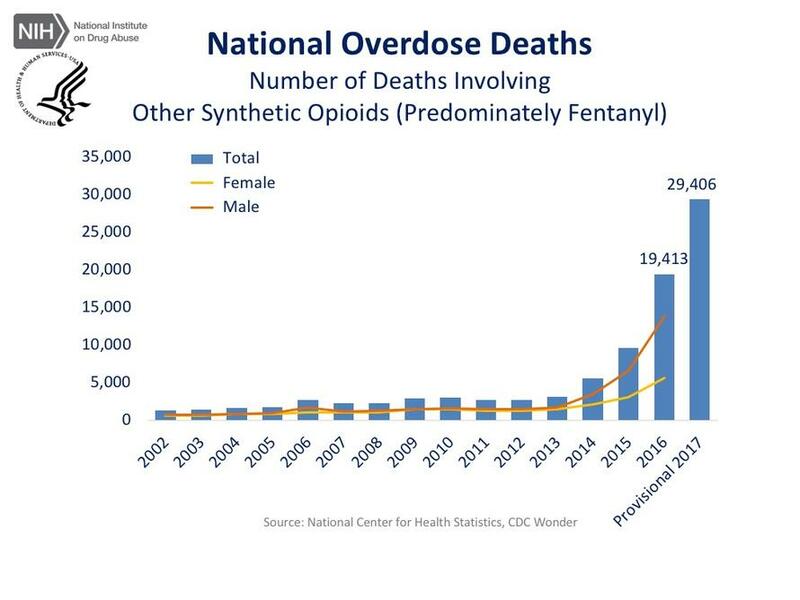 The DEA also found heroin-related drug overdoses had doubled from 2013 to 2016 because manufacturers illegally producing synthetic fentanyl have laced the heroin with opioids. President Trump declared the opioid epidemic a "national emergency" in October 2017. Last month, he signed a comprehensive bill that included $8.5 billion in funding for related projects to reduce addiction and deaths. Attorney General Jeff Sessions noted one positive trend in the study. 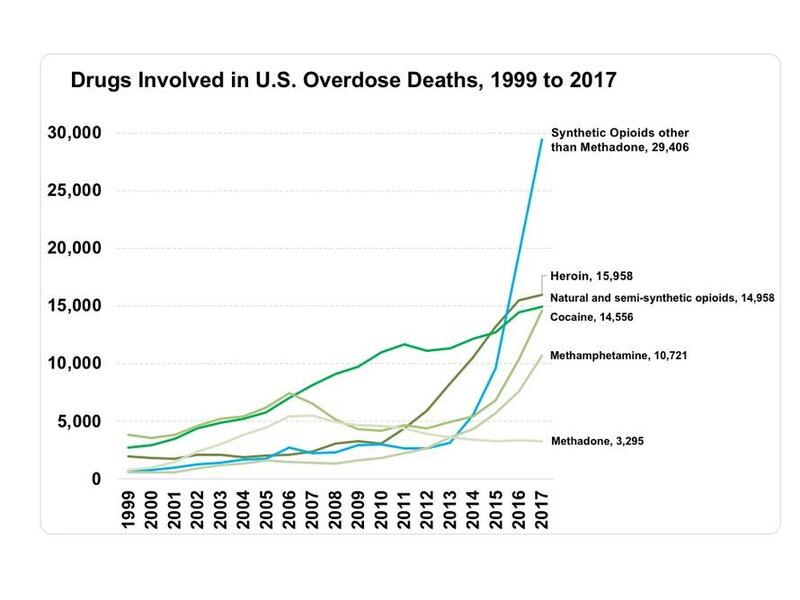 "Preliminary data from the CDC shows that drug overdose deaths actually began to decline in late 2017 and opioid prescriptions fell significantly," Sessions said in a statement.